To celebrate World Sight Day 2018 and to promote better vision in Europe, ECOO co-organised an event with MedTech Europe and the European Coalition for Vision on 11 October 2018. 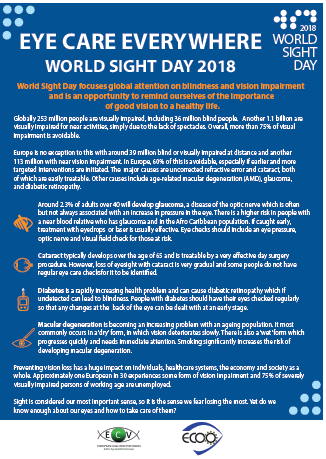 To mark the occasion, ECOO and the ECV produced a World Sight Day Leaflet with key facts on eye health and preventable sight loss. Click here to get your copy.